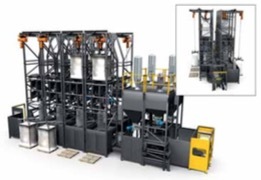 National Bulk Equipment, Inc. (NBE)’s fully integrated bulk material handling system uses RFID-driven process communications to automate simultaneous batching of multiple, and varied, chemical mixtures during a single processing operation. The process begins when an empty bulk tote is introduced to the system; RFID recognizes the tote and communicates to the system the specific batch recipe assigned to that tote. The primary ingredient is dispensed from one of four surge hoppers through a horizontal screw conveyor into the tote. As the first tote advances to its next batching location, a second tote enters the system and is recognized by RFID for processing. Each tote advances to one, or both, of two, subsequent batching stations where any one, or a combination of four secondary ingredients can be added based on the RFID recognition of the tote. Each secondary ingredient batching station consists of four bulk bag unloaders, each with integrated material conditioning to ensure consistent material supply is sent to a station-specific gravimetric feeder that provides accurate and repeatable secondary ingredient supply into the tote. Complete NBE process engineering, from ensuring NBE equipment met process-specific GMPs and risk assessment requirements, to the integrated automation of controls, sensors, monitoring, and data reporting, combined to increase batching throughput by 80% and eliminate potentially harmful repetitive motion actions by operators.